Hello and welcome to the first instalment of Guy With A Library Card. This column is a personal reflection based on two thoughts. The first idea is accessibility of information and the second is the notion that knowledge is power. I don't think I need to answer what these two concepts have to do with the library but I do think I should explain why this is not based on the Internet and its capabilities. I think the best way to do that is by explaining my own connection with this column. 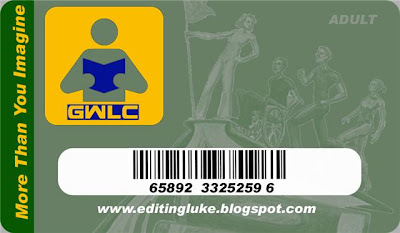 In the beginning when I had no library card, I considered myself a pretty regular guy. I didn't really read books, so I thought I had no real need for the library. Despite this, I did develop a knack to retain useless bits of information to blurt out when ever they did come to mind. With this, came a passionate pursuit to learn everything I can about everything I do. Now I didn't realize this until my teens when all my time and effort went into home theatre equipment. 15 years later and my stereo is worth more than all four cars I have owned combined. I learned about the best and bought the best. This habit has stuck with me and continues to be my process with everything I buy. I research specs and brands to the point that it's pretty disgusting. As I got older, started university and was out on my own, I continued with the no need for library policy including the university's. Then in my fourth year I noticed a roommate of mine was using the library. He kept taking out all these killer old cd's that are tough to find. Stuff like Dire Straits, Soul Coughing, Primus and old movie soundtracks. I started to play around on the library website and taking things out with his card. It was great because it was free and during university anything free is great. I started getting movies that I had not seen in ages like The Rock or Howard the Duck. I was so ecstatic that I became disappointed in myself that I hadn't discovered this before. A short while later, school was done for good, I found work out of town and my roommate with the library card sold the house and moved away. With a stroke of luck I returned to my old stomping grounds and managed to pick up a lady friend who loved to read and also had a library card. So naturally I started using her card. A few more classic DVD's later and I was hooked back. This time not because it was free but because the content seemed endless; strange documentaries, pop cd's, block busters, TV shows, books and all on a single subject of choice. It wasn't long until I was taking out more stuff from the library than my girlfriend and she promptly made me get my own card. Ever since then I’ve been visiting the library website almost daily and take out DVD's, CD's and even books regularly. If I get interested in a certain subject matter I search the library like Google and come up with all sorts of things I never imagined. The most enjoyable aspect of all of this is that it has helped me create a stronger bond with my daughter. We can both go into the library and come up with several things we want to check out even though we went in for no reason. Looking back, it seems ridiculous that I was so reluctant to use the library. Even more shocking to me now is that it took so long for me to realize how great the library is. The strangest thing I have come to realize is that if I tracked the items that I have taken out that I could get a comprehensive look at my life. This is what this column is all about. The library creates life in a quest for knowledge through various mediums. It provides accurate already researched information. It is accessible and fitting for all ages. Lastly, it provides you physical contact with your material. Although it may be outdated by the Internet's standards I believe it to be a better source for these reasons. So there you have it, the first rant for GWLC. The column will continue a little differently than this introductory piece but will be filled with my own personal thoughts, movie reviews and inspiration that all stem from a more and more forgotten resource, the library. You can find so much in the library I don't see why more people don't use it. Nothing beats a good book in my opinion!